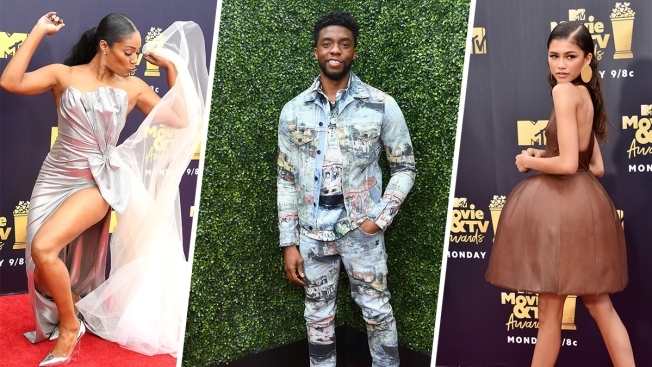 The 2018 MTV Movie &TV Awards aird Monday night and fresh off last year's historic revamp, the annual ceremony will once again celebrate the best of the best in both film and television. Award season favorites like "Call Me By Your Name" and "Lady Bird" have another chance to snag accolades, as well as more recent releases like "Avengers: Infinity Wars" and "I Feel Pretty." Check out seven things about the MTV Movie &TV Awards you'll want to know. 1. She Ready: Comedy queen Tiffany Haddish will make her hosting debut during tonight's show. She also makes history as the first black woman to emcee the annual spectacle and is nominated twice for "Best Comedic Performance" and "Scene Stealer." 2. Wakanda Forever: "Black Panther" leads the pack with seven nominations, followed by "Stranger Things" with six. Other contenders with multiple nods include "13 Reasons Why" and "Riverdale". Up for Best Movie is "Avengers: Infinity War", "Black Panther", "Girls' Trip," "It" and "Wonder Woman." Up for Best Show is "13 Reasons Why", "Game of Thrones", "Grown-ish", "Riverdale" and "Stranger Things." 3. But Wait, There's More! : MTV unveiled yet another surprise category, Best Musical Moment. Celebrating the best onscreen song and dance members, pop culture fanatics were able to cast their vote between a variety of unforgettable scenes. The nominees for Best Musical Moment are "Black-ish" (Cast performs "Freedom"), "Call Me By Your Name" (Elio crying through the end credits), "Girls' Trip" (dance battle), "Love, Simon" ("I Wanna Dance With Somebody" dream sequence), "Riverdale" (Cast performs "A Night We'll Never Forget"), "Stranger Things" (Mike and Eleven dance to "Every Breath You Take"), "The Greatest Showman" (Phillip and Anne sing "Rewrite the Stars") and "This Is Us" (Kate sings "Landslide"). 5. Trailblazing the Next Generation: The MTV Movie &TV Awards biggest honors go out to two special change-makers, Lena Waithe and Chris Pratt. The "Master of None" actress will receive the Trailblazer Award for her unique contributions to show biz and activism work. Meanwhile, the Generation Award will go to the "Jurassic World" star, who is being recognized for his outstanding work on both the small and big screens. 6. A Star-Studded Lineup: So how much star power can we expect to take in? Previously announced presenters include Kristen Bell, Michael B. Jordan, Mila Kunis, Seth Rogen, Zendaya, Common, Gina Rodriguez and more. 7. Gym, Tan, MTV Movie &TV Awards: Of course, all eyes will be on the cast of Jersey Shore, who make their return to the MTV Movie & TV Awards stage after eight long years away. The lovable guidos and guidettes are back on TV with "Jersey Shore: Family Vacation," and there's no doubt they'll bring their usual antics and fist pumps to Los Angeles.